Building Information Modeling (BIM) is on the rise, and it’s here to stay. Soon, the majority of municipal, hospital, and education projects will have some kind of BIM component during the construction phase. Owners are scrambling to comply with ISO 55000 requirements for asset management, and BIM is a growing influence on the path to compliance. If you’re a small to medium sized MEP contractor, you may feel like you’re getting squeezed. Just another requirement that tips the scales towards the big guys. Don’t worry. And don’t think you can’t quote BIM projects. 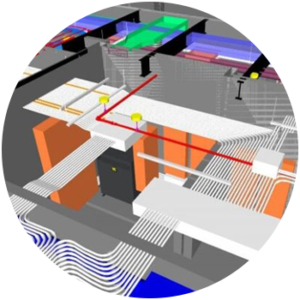 Draftech can guide you into and through the BIM maze – more economically than the big shops. Call us for BIM requirement quotes on projects you want to bid. We’ll get you a good number to plug into your proposal, and then deliver a great product when you get that job. We can help the big shops too! Let us help you through your tight deadlines, or when the volume overwhelms your own shop. General contractors – consider using us for your coordination and your MEP subs. We’ll get you to your sign-offs faster that you thought possible. Consider Draftech as your one source solution.